Inspired by vintage style, this elegant Neil Lane Designs bangle is made from sumptuous silver, presenting sensationally sparkling diamonds. In a chic selection of round, diamond and baguette shape silver encasings, round cut diamonds totalling 1/10ct are set to shimmer. 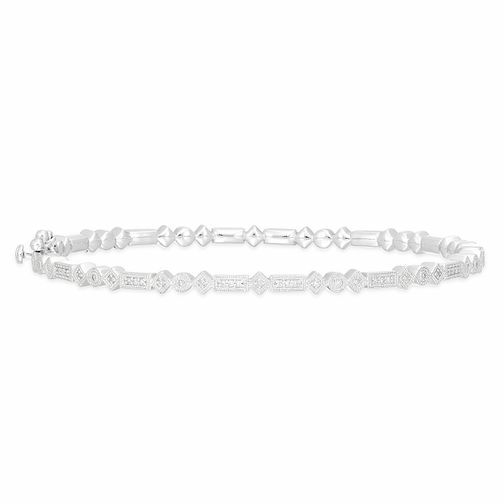 This beautiful bangle is perfectly versatile to add an extra glimmer of glitz to both day and night looks. Neil Lane Designs Silver 1/10ct Diamond Fancy Bangle is rated 5.0 out of 5 by 1. Rated 5 out of 5 by Anonymous from Elegant bangle. This product is very Elegant and comfortable to wear.